Oklahoma is on the doorstep of the College Football Playoff. The Sooners were No. 5 in the pivotal second-to-last College Football Playoff rankings released Tuesday night, ahead of Ohio State heading into championship weekend when the final four will be set. “I really don’t have a measurement for closeness,” selection committee chairman Rob Mullens said when asked what separated Ohio State and Oklahoma. Mullens cited Oklahoma’s historic offense. 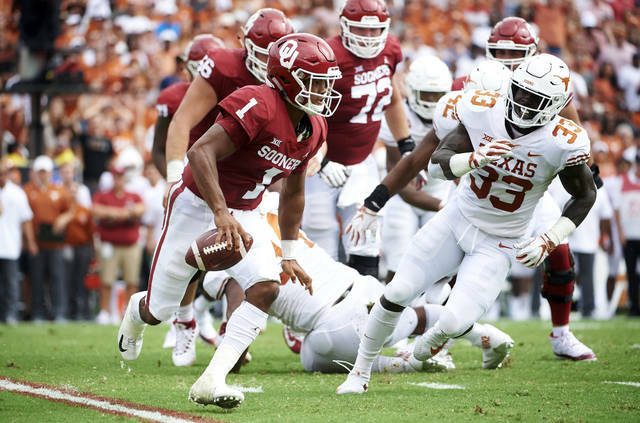 The Sooners are on pace to set an FBS record for yards per play, averaging 8.92. “While their defense has been a challenge, their offense has been superior,” Mullens said. The top three teams in the selection committee’s rankings held steady for a fourth straight week. Alabama, Clemson and Notre Dame — all unbeaten — are Nos. 1, 2 and 3. Georgia moved into the fourth spot that was previously occupied by Michigan, heading into its SEC championship game against Alabama. It’s a given the SEC winner makes the playoff. Maybe the loser, too. There is some precedent. 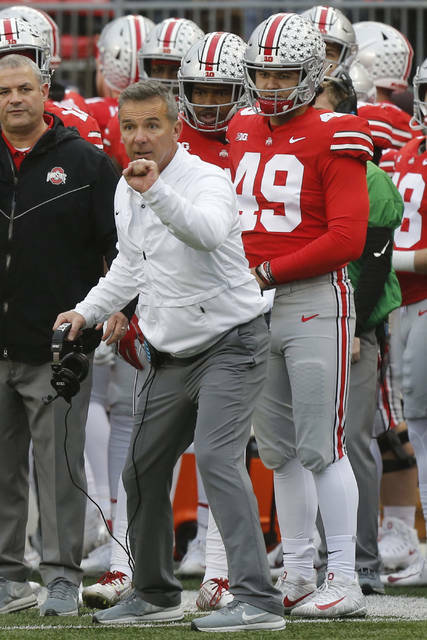 In 2014, Ohio State beat Wisconsin 59-0 in the Big Ten championship game and jumped from sixth to fourth, passing co-Big 12 champions Baylor and TCU. The Buckeyes might need a similar performance to have a shot this time. What could make SEC haters even angrier? Alabama beats Georgia 31-28 on a last-play field goal and the committee is so impressed with the Bulldogs they just throw them in there at No. 4, despite the two losses and lack of a conference championship. After Washington State lost to Washington last Friday to hand the Huskies a spot in the Pac-12 championship game, the assumption was Wazzu was still in fine shape for a big game. Maybe the Fiesta Bowl. Upon further, review probably not. The Cougars (10-2) were ranked 13th, behind ninth-ranked Florida, 10th-ranked LSU, 11th-ranked Washington and 12th-ranked Penn State, all with three losses. Wazzu will likely settle for the Alamo Bowl and the Pac-12 will get just one team in the New Year’s Six . Orange Bowl (semifinal): No. 1 Alabama vs. No. 4 Oklahoma. Cotton Bowl (semifinal): No. 2 Clemson vs. No. 3 Notre Dame. Rose Bowl (Big Ten/Pac-12): Ohio State-Washington. Sugar Bowl (Big 12/SEC): Texas vs. Georgia. Peach Bowl (at-large/at-large): Michigan vs. Florida. Fiesta Bowl (at-large/at-large): UCF vs LSU.